This year is turning out to be the season of the stewards. In the often-chaotic Singapore GP, their influence once again affected the result but this time in less obvious ways than at Spa. Consider, for instance, how their previous decisions stole what looked like an inevitable win from Felipe Massa at the Marina Bay circuit. Cast your minds back to Valencia and Massa's pit stop in which he was released into the side of Adrian Sutil's Force India. For that offense, the stewards decided not to penalize the Brazilian as laid down in the rules and, instead, fined him a sum that was nominal in F1 terms and, more importantly, did not take his victory from him. In the same race, Kimi Raikkonen had a botched pit stop that seemed to have much to do with the Ferrari system of lights rather than a lollipop man. Now, had the stewards done the correct thing and imposed a drive-through penalty on Massa, it is very likely that the Ferrari team would have looked closely at their pit release procedures to ensure that such errors were no longer possible. One can only presume that they were reassured by the stewards' verdict, certain that this was one more rule that would never be applied to them in its full force. The system remained in place, a lurking problem ready to come back and bite them. 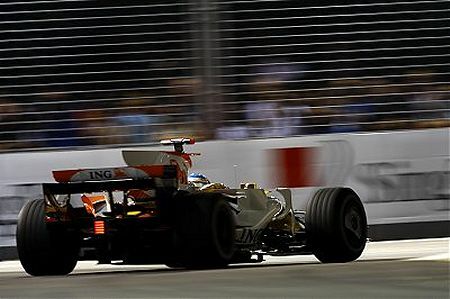 In Singapore it did just that, prompting Massa to leave the pit before the fuel hose had been disengaged and, once again, launching him into the side of Adrian Sutil (what has Ferrari got against the poor guy?). The trailing hose may have forced Massa to stop at the end of the pit lane, thereby effectively ending his chances in the race, but the subsequent drive-through penalty was more likely to have been given for the unsafe release into the Force India (certainly, it should have been). That it should have been a standard penalty this time, rather than a fine, looks very much as if the stewards saw it this way on this occasion because it had no effect on Massa's race - he was already last, thanks to the incident. That may seem a bit far-fetched but the Ferrari team obviously does not think so - for Massa's second stop, they used the trusty lollipop. Interestingly, something very similar happened in one of David Coulthard's stops; the lollipop was lifted and he began to leave with the hose still attached. But the lollipop man was quick enough to slam it down in front of DC and he stopped. That, surely, is argument enough for the end of Ferrari's system of lights. There was another incident in the race that, incredibly, involved the hapless Sutil with Felipe. Late in the race, Massa spun at the entrance to the grandstand underpass and then moved out on to the racing line just as Adrian arrived. With nowhere else to go, the Force India driver had no option but to stuff his car into the barrier. He went no further. Predictably, the stewards took no action on what was clearly a dangerous maneuver on Massa's part. The stewards had their say in other matters as well. Before the race even began, Nick Heidfeld was handed a three-place grid penalty for blocking Barrichello on a flying lap. Yet Nick was in the slowing down lane for the pits, as required. How can he be penalized for the bad placing of the pit entrance, a fact that had been pointed out before a car turned a wheel on the circuit? And for the stewards to then fine Barrichello for aborting the lap and entering the pit lane behind Heidfeld, without using the slowing down lane, merely highlights the fact that Nick was a victim of poor circuit design. As it happened, such irrational and inconsistent stewarding failed to spoil what turned out to be an exciting and interesting GP. It is somewhat ironic that Nelson Piquet's accident gave his team mate, Fernando Alonso, the chance to win the race, an opportunity that he seized with considerable panache. Alonso deserved this win after a season of battling against the deficiencies of his car. And I think the theory that Renault timed Piquet's accident to give Alonso the maximum benefit from his early pit stop is really asking a little too much of Flavio Briatore's calculating powers! There is irony, too, in Hamilton emerging from this race with exactly the six points gained that he lost to bad stewarding decisions at Spa. He drove a mature race this time out, staying close enough to Massa in the first stint to be a factor, then taking his chances when they were presented in the remainder of the race, but not risking a challenge on Rosberg when it was unnecessary from a championship point of view. It was good to see Nico Rosberg on the podium, his second place a deserved reward after clever handling of the inevitable ten second penalty he received for having to pit during the safety car period. Poor Robert Kubica, also forced to take the stop and resulting penalty, was unable to do the same, being stuck in traffic at the time. The verdict on Singapore has to be that it was better than Valencia. It took a safety car to really mix up the field but, once that had occurred we saw overtaking where none was deemed possible. It was difficult, as demonstrated by Fisichella and Trulli holding up faster cars for long periods, but opportunities came to the patient. Add the unusual finishing order, the spectacle of F1's first night race, and we have no cause for complaint, I think. A perfectly executed strategy by Renault. Fuel Alonso lighter than the front runners and get the least-performant Michelin out of the way. Bring him in, switch to the optimum tyre and fuel him for a longish middle stint giving good flexibility. Ask No. 2 driver to "throw" a rookie error and bring out the safety car. The injustices of qualifying righted by clever tactics. Inspired. Do you think we will see it again at Fuji? Well, I'll say this, Punter: If that really was a strategy devised by some feverish brain in the Renault team, they deserve the win for brilliance alone! That was tasty,the race not my humble pie.Once again Clive you`ve took the words out of my mouth,but I would be a little more cynical.Flavio and Schumacher were as thick as thiefs in Bennetons early days,He appeared to have a very fast accident on a 2/3 gear corner,sort of a thottle jammed open sort of spin,on an area of no cranes,just after the first person to Pit,who happen`s to be He`s team mate,Is getting my cyncail bell ringing.And turn 18 with Massa re-joining the race in front of Suttil,if Massa isnt at fault why isnt Suttil being punished for going through a yellow flag zone to fast ie to fast to take the corner resulting in him crashing(was Massa getting out of the way of the approaching Suttil who he could see was losing it? ).And the award for `they must be bigger than King Kongs`was to the single marshal stood there with a broom with He`s back to the cars sweeping up Suttil`s nose cone.Was Charlie blowing a whistle and sending them `Over the top`.And good to see Man`s re-invention of the wheel going the way they normally do,Ferrai Pit Light System Zero Vs Dinner plate on the end of a broom handle One (the inconsistency with the penalty is so blatent I thought someone else might like to get the ball rolling on that one). Interesting about SpeedTV, but like you said originally... probably not! years have been on F1. Gusto: I know Flavio is capable of some very dirty tricks at times but I hesitate to credit him with Piquet's accident. I really don't want to think he's that clever! Nick: There's no doubt that the regulations and aerodynamic development have made far too many F1 races boring in the extreme. It is perhaps fitting that it should be the safety car, an imported idea from the States, that turned Singapore into a memorable GP. Personally, I don't care where the ideas come from as long as they improve the racing. primarily, then sport as opposed to what is honest sport that is documented. If the show panders to the highest bidder, most popular, or just to the emotions of the public while compromising the integrity of the sport itself, it isn't honest sport. It is circus. If CART racing had not compromised itself, perhaps it would still be around today. This may be very idealistic, but isn't F1 supposed to be about the ideal of fair competition? I have to disagree on the opinion that this was a good race. A race whereby a safty car randomising the field and then it being so difficult to overtake that causes the result to be somewhat false is not good in my opinion. Add that to the fact that there seemed to only be one overtaking spot (which in fact also required the overtaking driver to nail the 3 or so previous corners and the driver in front to make some mistakes) makes this one of the most spectacular looking but also most spectacularly poor track on the calendar. They chuck out Silverstone and add in these Scalextric style tracks! Why? However under the circumastances Alonso fully deserved the win and Hamilton got justice by driving a very mature race. Nice to see a Williams back on the podium again too, lets hope it is the first of many. Nick: I agree that F1 must be seen as fair and sporting or it becomes a branch of the entertainment industry with results fixed in a way to ensure the greatest popularity. That is the struggle within F1 at the moment, the battle between the sport and the show, and I find it totally unnecessary. Long before the show became a factor, F1 had a huge international following and I don't believe its growth would have been any less had the FIA not begun its campaign to add to its entertainment side. As new and ignorant fans have been added, so true enthusiasts have given up in disgust. If F1 provides a genuine and fair battle for a championship unsullied by political machinations, the audience will remain. Lee: Singapore was a good race because it became unpredictable after the intervention of the safety car and various incidents. We can bemoan the fact that, without these interferences, the race would have been a procession, but it remains true that those events did happen and they created a chaotic but entertaining race. I have been against the introduction of the safety car from the beginning but have to face the reality that it is now standard practice. So I agree that it is folly to get rid of old races like Silverstone while building characterless new circuits, but I also have to deal with the sport as it is now, rather than some ideal that exists only in my head. I don't like the direction the FIA are taking it in - I have my say and then watch the races, hoping that sport will triumph in the end. Singapore became an interesting race through circumstances and I cannot deny that. Next year it may be a featureless non-event, who can say? Gusto: Interesting what you say about Australian marshals. Considering how untrained the marshals were at Singapore, that may be an important pointer towards the future for new circuits employing people entirely unused to working at motor sports events. It makes sense that a group of experienced marshals from older tracks should be sent to new circuits to teach new marshals the basics. I don't like safety car at all, nor that stupid rule of penalty for those who are running out of fuel. That's a standard feeling, IMHO. But that's only a part of the question, and we must try to see it from the other side. Sure there are hundreds of stupid rules that engineers, drivers and principals of the F1 team don't like. But running till your fuel tank is dry, using each pound of fuel, is as a gambling as keeping your driver in the safe side and calling him for pitstops with two laps of fuel as a security margin.... That is the kind of game that rule brings to competition. You can try the safe side or you can't take risks being 0,2 sec faster, but knowing that there's a risk... you can loose it all. From that point of view I can't see anything wrong with the rule.... nothing at all... In fact bashing this rule would be the same as bashing tyre changes. It's a standard to make two tyre changes... but why not only one???? because there's a risk, maybe too high, that your tyres won't survive a 30 laps stint. The same can be said about fuel... keep 2 laps of fuel on board when you make your pitstop... easy. Didn't see most of the pit-lane and safety car madness as I was too busy watching Rossi win the world championship for an amazing 8th time on BBC2 but I did see Massa's stop, couldn't help but have a little chuckle and it's good the score is even though. The race was quite good but still without the safety car it looked to be yet another processional boring one. Amen to that, Architrion. I don't see any reason why people love to bash this rule when one can almost always work around it. Maybe I am the odd one but I don't see Ferrari blowing their lead with a dangerous mistake as an evening up of anything. The FIA didn't stick crazy glue on Ferrari's fuel nozzle. The stewards penalizing Ferrari for this, under these circumstances, can only be seen as a ploy to doctor the records so as to look less biased. It is like taking away Shumacher's points after he's lost the title. Massa caused an accident toward the end of the race that could very well have merited another team a 10 place penalty for the next race had the Ferrari been the car to go out. I agree with Nick about the evening up business. That was a Ferrari mistake compounded by a badly designed refueling system which must be due for replacement. Nothing to do with evening up Spa or the ludicrous Valencia penalty. I don't like the pit closing business because it is entirely random. Gambling on tyres is one thing because you can work out what the odds are on it working. It is fine to say keep 2 laps of fuel spare but you could do that and still run out of fuel by the time the pits are opened again. The whole thing is too much like rolling dice for me. I want to ban pit stops of any kind apart from emergencies and let the drivers sort it out on track. That also has the advantage that although a safety car would close up gaps it would not shuffle the order randomly. Not to say that Renault premeditated Piquet's crash, but one would have to be naive to think this couldn't happen. Look at Shumacher at Monaco, or taking a run at Villeneuve. These actions are planned and cold blooded. There are quite a few people in F1 that don't care for one second how the game is played just so long as they win. To inflict safety cars on a race is to open a huge can of worms with the possibility of many different and arbitrary penalties. As we have seen, in any arbitrary decisions, there is a great deal of room for bias and politics. Sorry, Steven, but I think you miss the point. First of all, everything is random in this sport. How many hours an engine works is pure lottery. How many blocks Hami's front tyres will resist is random, as is the lifespan of a gearbox. The game is to maximize the performance while keeping risk low. Safety car is as random as the computerized brain that rules the engine or Alonso's fuel pump. If you fell that 2 fuel laps is not enough then save three. If you believe that 2 hours and 18000 revs will blow your engine then half an hour at 18000 and the rest at 17000 will save the day... but you'll be as slower as if you would have saved three laps of fuel. Clive, this is out of this issue, so please remove it as soon as you can. I tried to write a comment from a Nokia N95 using Opera Mini and I always got an error saying the code was invalid..... I repeated several times with no luck at all, although I was prompted for the same code, and I think I wrote it right. Maybe I'm getting old and I'm sick of Parkinson... but I think the code was right.... Is it me, is it Nokia, is it Opera Mini or is it your code system????? You are right to say how engines, tyres etc work is to a degree randome but there is a significant difference between those sort of factors and the pitlane rule. A team can work to make its engine more reliable and theteam that does the best job gets the reward. McLaren can use different braking material, temperatures to give Lewis the best chance not to block a wheel and if they do a good job they get the reward. The pitlane thing is dumb luck and there is nothing a team can do to improve how it will work for them. They can carry more fuel but even that requires an element of luck. Architrion: I occasionally get that happening to me too - the thing seems to get hung up on one particular CAPTCHA code and then won't accept anything you input. The answer I've found, is to copy your comment to the clipboard, leave the comments system completely and return to the main article; then hit the comment button and try again, pasting in your comment. So far, that has worked for me every time. Motor racing has always been about cutting things as fine as possible without stepping into the area of the DNF. The ideal engine is supposed to be the one that produces masses of power and then explodes as the car crosses the finish line. Colin Chapman's designs were notorious for approaching the absolute limit of paring everything to the bare minimum, so much so that Lotus acquired a reputation for fragility. But there is a difference between gambling in this way and preparing for the worst. The present safety car rules impose an element of complete unpredictability on the teams - they can prepare for safety car periods by putting extra fuel in the car and so being slower, or they can take the risk of there being no safety car and being a little bit quicker. As it happens, none of the teams take the safe but slow option, probably because they would lose too much over a full race distance for very little return. So, as long as the closed pit lane rule remains, there will be cars that have to pit for fuel and take the resulting penalty. Rosberg demonstrated in Singapore that it then depends on luck as to whether you can minimize the disadvantage of the penalty. Have a few clear laps to build a lead and your penalty amounts to very little, get stuck in traffic and you fall to the tail end of the field. How fair is that? I've discovered that if I leave my computer for any length of time with a post that has been started but not completed, I will not be able to post it. Something times out here. That'll be the session on the server timing out. I've set it to be quite long but, yes, if you wander off for sometime the session will expire and your post won't work. I'm loathe to extend the session further as with this being a popular blog it would extend the workload of the server. I'd suggest copying the post before you hit submit so that if it does fail you don't have to rewrite anything. It's also worth noting that nobody can know how long a Safety Car pit closure will last if it does happen. Sometimes the pit lane is opened after one lap, sometimes after three, occasionally after five (or in the case of Fuji last year, six). That sort of variability cannot be predicted properly. At that stage you're into results changing according to how long the pit closure is for, which means guessing in advance how serious the Safety Car-triggering incident will be. That's very random. I`ve noticed it does,nt like the number 8,copy and paste into a new page works for me,I think were missing the point,which is safety car has the word Safety in it,drivers these days might just feather the thottle though a yellow flag phase,as long as there sector times show a 1 milli-second negative there OK,now is that safe,no .Is the safety car fair,no.But the latter is more unlikely to get someone run over.and at the end of the day that`s what is important.What you lose on the roundabout,you gain on the swings. I was stood at the left/right hander before the bridge at Snetterton race track(before the redesign) with friends in 86 when a marshal moved us on,cursing as we made our way to the Bomb hole curve,did not a formula ford like car wipe out the area where we were just stood,if that marshal had,nt risked he`s life to run out of he`s post,I might not be here to sing there praises and voice there my concerns. Agreed, Gusto - the marshals do a great job when properly trained. The problem arises with new circuits with no time to train the marshals. I have to say that the safetycar i a good thing after all. But i can also see one other solution to the problem. Let there be a speedlimit under the yellow flag, as when the drivers pass an area with yellow, they will have to keep the pitspeedbutton activated and the taillight flashing. That might take away many of the unnecessary risks with drivers racing like mad dogs to catch up with the bunch trailing the safetycar and may even deem the safetycar useless at all. Bjorn, that idea makes a lot of sense. Especially if they do something like tie it to the pit-lane speed limiter. It may even be worth making all yellow-flag zones restricted to pit lane limits. After all, the reason the pit lane is speed limited is because the cars need to be prepared to come to a quick stop if there's someone or something in the way, which is also why cars are slowed down in yellow-flag zones. Pit lane limiter during yellows,excellant idea.Perhaps the Marshals could be part of the steward system we need to travel to each race,for a sport that has the budget of a small country,not to employ a full quota of independent professional stewards and marshal`s,working to a clear and concise rule book is surely an area of F1 that needs dragging(kicking and screaming) into 21st Century,or would they be too independent for the likes of Max and Bernie? A bit Late to the party here, but the pitlane limiter is a good idea. The solution to the safety car problem also lies in NOT deploying the safety car to every minor crash, but only when the track is blocked or the car is in an area that requires workers to be "in harms way". Then the pitlane should be opened at the end of the pace cars first lap every time. The cars should be slowed and bunched by that time if the Safety Car driver knows what he is doing.